Click On-Line Form to submit a secure, web-based form where you can provide information such as suspect description, vehicle information, crime notes, drugs, and photo uploads. Fill out as much as you can. Call 270-443-TELL [270-443-8355]. Phones are answered 24 hours a day. 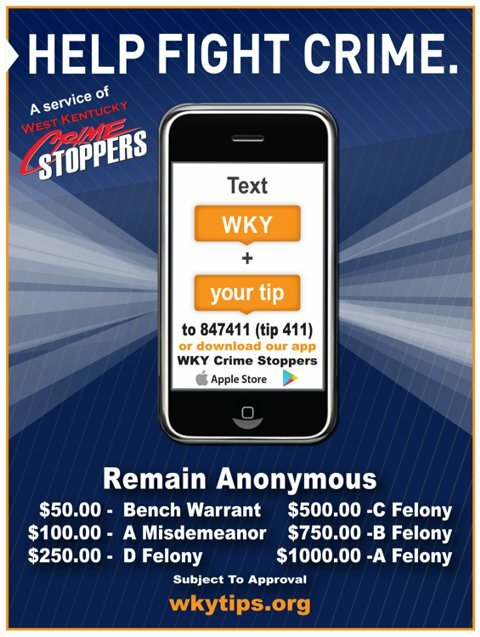 If an arrest is made based on a tipster's information, the person who provided the tip may be eligible for a reward ranging from $50 to $1000. "Modern technology carries with it both good and bad. This is a great breakthrough that I believe has great potential in benefitting both law enforcement and our community. Often times citizens provide information to us concerning illegal activity while desiring to remain anonymous. On many occasions, the need to ask specific questions can be vital to the success of any investigation. This new two-way reporting mechanism will bridge the gap of both communications while simultaneously enabling the citizens to remain anonymous."